Seajets is a Greek/Cypriot ferry company operating passenger and freight ferry services in the Aegean Sea. Seajets was founded in 1989. Today it operates one of the largest fleets of high speed vessels on routes from the ports of Piraeus and Rafina to several Cycladic islands and on routes between Crete (Heraklion – Rethymnon) and the Central Cyclades (Santorini, Ios, Naxos, Paros and Mykonos). In total, Seajets sails to 17 islands. The majority of these routes are seasonal, operating between April and October each year. 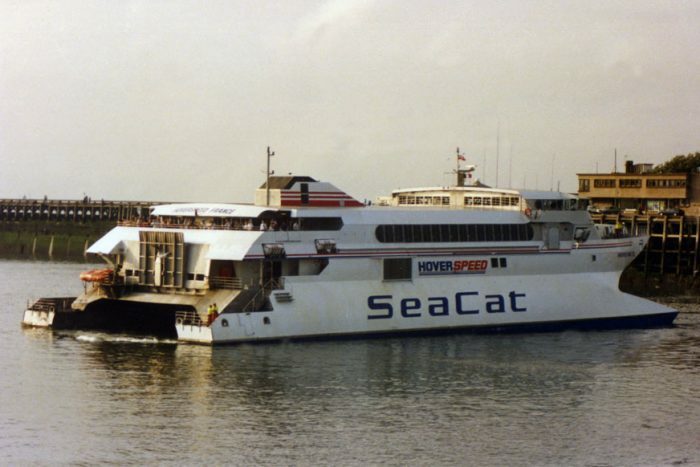 HSC Champion Jet 2, ex Condor Express, Incat 042 – Aluminium catamaran built in 1996 by Incat (International Catamarans) Australia Pty. Ltd., Hobart, Australia (Yard No. 042) for Shipping Company 9/12 1994 LP Pte, Singapore as a car and passenger ferry.